Once you enter your mobile number, a verification code will be sent to your mobile. Use the code to verify your mobile number on the next screen. The discount is only available for purchasing bus tickets from Shohoz Buy Bus Tickets Android App. The discount is valid up to 2 transaction. Discounts are subject to​​ availability of seats. This offer is not valid for certain bus operators / trips (Greenline, ENA Transport). Further, this offer cannot be used to purchase bus tickets for travel during weekends (Thursday-Saturday), Eid travel​ ​or government holidays. This offer cannot be clubbed / merged with any coupon discount. In case, users want to use a discount coupon, other than referral, to buy a bus ticket, the discount would be applied on the original ticket price, and not the discounted ticket price. Shohoz.com's usual refund and cancellation policy apply. Shohoz.com reserves the right to change the terms and conditions of the offer or stop the offer at any point of time. ​The offer is valid till ​15th January 2018. All registered Priyojon prize point and partnership program customers can enjoy this offer. Icon customers can also enjoy this offer as well. To avail the offer customer needs to log on to www.shohoz.com or call 16374. If the customer is Priyojon prize points or partnership registered they will be able to avail the offer. ৳ 121 discount per seat will be valid till 28 Feb 2015. This offer cannot be clubbed/ merged with any other ongoing discount offers available at Shohoz.com. Regular ticket terms and conditions of Shohoz.com apply. Buy bus tickets from Shohoz.com this winter and get ৳ 100 OFF per seat. 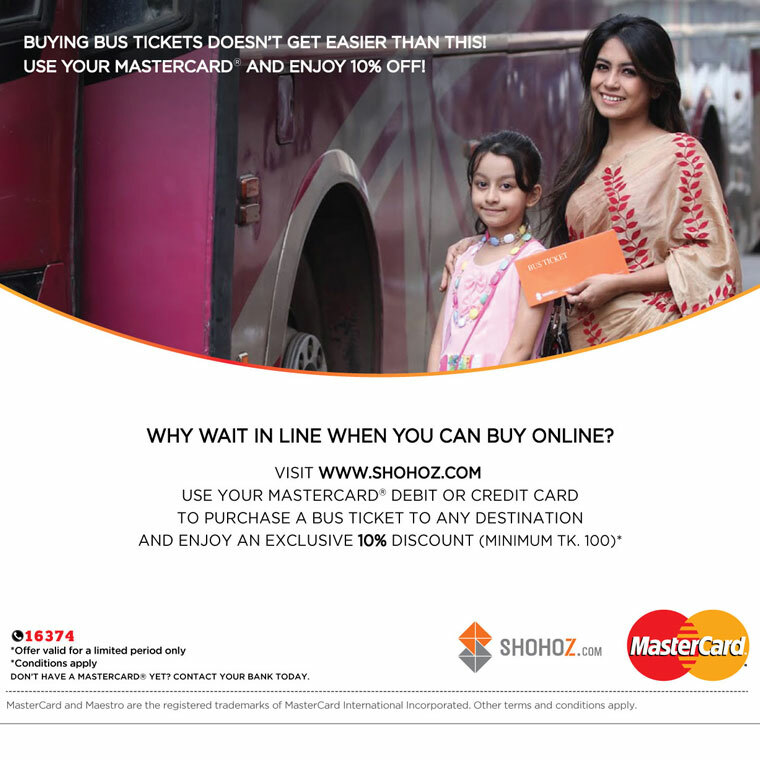 Anybody who purchases bus tickets from Shohoz.com can avail the offer. The offer is applicable for buses plying on all routes available with Shohoz.com. Customers would get ৳ 100 discount per seat till 31 Dec 2014. Shohoz.com reserves the right to make changes/ update/ edit the offer at any point in time. Shohoz.com reserves the right to dishonor/ restrict any transactions to avail the discount offer, if found fishy/ illegal as per its policies. 2 Nights & 3 Days twin accommodation at Long Beach Hotel, Cox's Bazar. Accommodation in well-furnished air-conditioned room (Superior Deluxe). Welcome drink (non alcoholic) on arrival at the hotel. Complimentary breakfast at the hotel. Two bottles of complimentary mineral water (500 ml). Per day 01 hour complimentary use of swimming pool. Free Internet LAN line in the room and Wi-Fi in all area of the hotel. Onward and return journey (Dhaka - Cox's Bazar - Dhaka) in Saintmartin Paribahan AC - Business Class Bus. The offered package price is inclusive of VAT and service charge as applicable. This offer is valid for bookings between 14 Feb 2015 to 28 Feb 2015. The offer available on first come first served basis. No refund in case the booking is cancelled 24 hours before journey time from Dhaka. 50% of Package price would be deduced if the booking is cancelled 48 hours before journey time from Dhaka. If the journey / trip is cancelled due to Hartal or Strike, 100% package price would be refunded. For cancellation or any query please call *16374*. Eid tickets are non-refundable and can not be cancelled or rescheduled. For convenience, download our Android App. Buy bus tickets anytime from anywhere. For convenience, download our Android App now! Payments through bKash will not be available from 18 May 10:00 PM till 20 May 10:00 AM. Please pay through Credit/Debit cards or choose Cash on Delivery. Pay by MasterCard and get 10% OFF on bus tickets. 10% Discount or Tk. 100 off (whichever is higher) on every ticket purchased through Shohoz.com website (www.shohoz.com). The offer is applicable on the first four transactions (Ticket PNRs) in a month using the same mobile number. This offer is valid till 25th July 2015 excluding the journey dates for Eid travel. This offer is available ONLY at Shohoz.com website (www.shohoz.com). Cardholder must use his/her MasterCard Card to avail this offer. This offer is valid for all types of MasterCard branded products (Debit, Credit & Prepaid). This offer is applicable only if full payment for the tickets purchased through www.shohoz.com are made using a MasterCard card. This Promotion cannot be clubbed with other offers. Promotion is subject to availability of seats/bus operators. Other Cardholder terms and conditions will be applicable. In addition to the above terms and conditions, the regular ticket terms and conditions of Shohoz.com apply. MasterCard Asia/Pacific Pte. Ltd. and Shohoz.com reserve the right to change the terms and conditions. Offer not valid for Eid trips, which are trips departing Dhaka from 9th July to Eid day (inclusive) and trips returning to Dhaka between 20th and 30th July (inclusive). Click for Details Eid tickets are non-refundable and can not be cancelled or rescheduled. For convenience, download our Android App. Grameenphone STAR Subscribers get 15% OFF on bus tickets. 15% Discount (upto Tk. 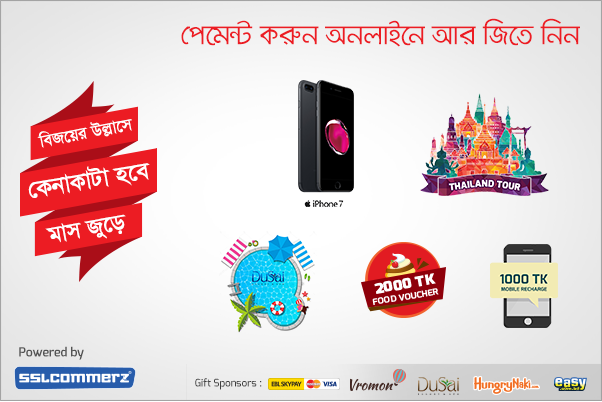 200) on every ticket PNR purchased through Shohoz.com - Grameenphone co-branded portal (www.shohoz.com/grameenphone). The offer is applicable on first four transactions (Ticket PNRs) in a month using the same GP STAR mobile number. This offer is valid till 31th August 2015 excluding the journey dates for Eid travel. Choose origin, destination cities and journey date(s). Choose convenient bus operator and select your desired seats. Enter passenger details with a valid Grameenphone STAR mobile number and email address. Get Promo Code via SMS as mentioned on website. Enter the Promo code in the Promo code section before proceeding for payment and avail the discount. You can pay for your tickets using your Debit / Credit cards, Mobile Payments, Internet Banking or cash. While paying through Debit / Credit cards, you can choose to pay with BRAC or Dutch Bangla Bank payment gateways. Select MasterCard, VISA or DBBL Nexus as per your card type. For queries, or to buy tickets customers can also call 16374. You may not be booking via co-branded web portal https://www.shohoz.com/grameenphone . You may not have entered a valid Promo Code. You may have exceeded the number of monthly transactions on your mobile number. 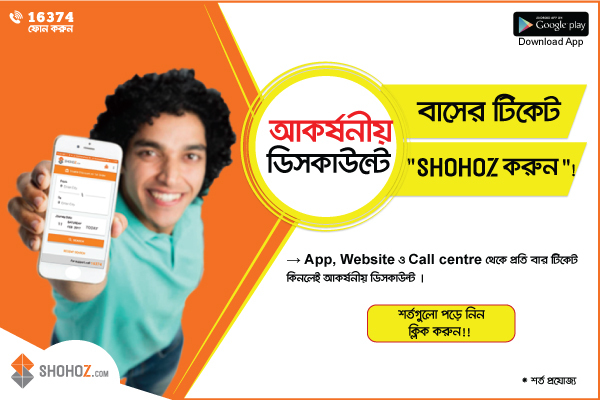 This offer is availed ONLY through Shohoz.com - Grameenphone co-branded portal (https://www.shohoz.com/grameenphone) and Shohoz.com Call Centre. The offer is valid till 31 August 2015. This offer cannot be used to purchase tickets of Greenline Paribahan through Shohoz.com Call Centre. One unique customer (using an unique Grameenphone GP STAR mobile number) can do upto 04 transactions a month. In case of trip cancellation by bus operators or due to strike (Hartal), full ticket price (excluding the discount) is refundable. However, the Shohoz Convenience Fee, bank charges, processing fee for mobile payment gateways as well as Cash on Delivery fee (Delivery Charge) are non-refundable. This offer cannot be clubbed / merged with any other on-going discount offers available at Shohoz.com. This offer is subject to availability of seats/bus operators. Grameenphone and/or Shohoz.com reserve the right to change the terms and conditions of the offer at any point of time. Pay with bKash and get 8% Cash Back per transaction for purchases bus, launch, event & movies tickets at shohoz.com website..
Cashback can be availed maximum up to Tk. 200 on every ticket purchased through Shohoz.com website (www.shohoz.com) or Call Centre. This offer is valid till 6th June 2016 or five days before Eid-ul-Fitr whichever is later. This offer can be availed through Shohoz.com website (www.shohoz.com) or Shohoz.com call centre @ 16374. The cashback can be availed only if you make payment for the bus tickets through your personal bKash account. The cashback amount will be credited to your personal bKash account within next business day. The cashback amount will be credited to your active personal bKash account having complete profile information. This offer is applicable only if full payment for the tickets purchased through www.shohoz.com or call centre is made through bKash. bKash Limited and Shohoz.com reserve the right to change the terms and conditions. This offer cannot be used to purchase bus tickets during Eid-ul-Fitr. Eid-ul-Fitr journey dates would be declared here on the website as soon as the bus operators publish them. Post your photo holding a Frooto on PRAN Frooto Facebook Fan page and get 10% discount (up to Taka. 150) per ticket PNR / transaction on bus tickets and launch tickets on Shohoz.com. 10 Lucky participants gets 2 nights 3 days stay at a luxurious hotel at Cox's Bazar. This offer is valid till 31st August 2015. This offer cannot be used for purchasing tickets for your travel during Eid-ul-Fitr. Click a photo holding PRAN Frooto. Visit PRAN Frooto Facebook Page (https://www.facebook.com/pranfrooto) and post the photo. Once your photo is approved, you get a discount Coupon code. Visit www.shohoz.com or call 16374. Once you buy bus tickets or launch tickets from Shohoz.com, use the discount coupon code to avail the discount. Moreover, Lucky 10 participants would get 2 nights 3 days stay at a luxurious hotel at Cox's Bazar. The discount coupon code you are using might have been used earlier. You may not have entered a valid discount code. The offer is valid till 31st August 2015. One discount coupon code can be used only once and users can avail a discount maximum up to Taka. 150 per ticket PNR / transaction. PRAN Frooto and/or Shohoz.com reserve the right to change the terms and conditions of the offer at any point of time. Buy bus tickets from Shohoz.com website (www.shohoz.com) or Call Centre by dialing 16374 or 09613101010, and get a discount of Taka 100 per seat. The offer is applicable only for first time customers on the first two transactions (distinct Ticket PNRs) during the period when the offer is active . The offer is valid till 30 September 2015, excluding the journey dates for Eid travel. The offer is valid till 30 September 2015, which can be extended or paused at any point during the campaign. An unique customer can avail the offer maximum of 2 times during the campaign period. In case of trip cancellation by bus operators or due to strike (Hartal), full ticket price (excluding the discount) is refundable. However, the payment gateway fee / Bank charges, processing fee for mobile payment gateways as well as Cash on Delivery fee are non-refundable. This offer cannot be clubbed / merged with any other ongoing discount offers available at Shohoz.com. This offer is subject to availability of seats / bus operators. This offer cannot be used to purchase bus tickets during Eid-ul-Azha 2015. Eid-ul-Azha journey dates would be declared on the web portal as well as communicated through the call center as soon as the bus operators publish them. Shohoz.com reserves the right to change the terms and conditions of the offer at any point of time. ২. ৬০০ বা তার কম মূল্যের টিকেট পাবেন ৯৯ টাকায় ! ৩. ৬০১ বা তার বেশী মূল্যের টিকেটে পাবেন ২০০ টাকা ডিসকাউন্ট! SSLCOMMERZ has taken their preparation to organize the biggest online campaign for all the merchants and customers connected or doing their regular online transactions with SSLCOMMERZ. Payment must be made through SSL Commerz Payment Gateway. Minimum transaction amount for enlisting into this campaign will be BDT 2000.00. It must be a successful transaction. Every refund transaction will be excluded. There will be no barrier on Transaction Number for any cardholder. Ar ki Chai? App theke order korlei aro beshi discount pai! Get regular discount of upto Taka 150 on Bus tickets on regular purchase from Shohoz.com Android App, Website, Shohoz partner, Hotline number (16374). Avail a discount of upto Taka 300 per ticket on your first transaction/order through the Shohoz Bus Android App. Maximum of 4 seats can be bought per transaction/order. Avail regular discount of upto Taka 150 per seat on regular bus ticket purchase through Shohoz.com website, Android App, Hotline or Shohoz Partners. Discounts are subject to availability of seats / bus operators. This offer is not valid for certain bus operators / trips. Further, this offer cannot be used to purchase bus tickets for travel during weekends, Eid travel, long weekends or government holidays. This offer cannot be clubbed / merged with any other ongoing discount offers available at Shohoz.com. In case, users want to use a discount coupon to buy a bus ticket, the discount would be applied on the original ticket price, and not the discounted ticket price. Refunds are not applicable if tickets are cancelled or rescheduled by the customer after confirmation. In case of trip cancellation by bus operators or due to strike (Hartal), full ticket price including Shohoz Convenience Fee per seat (excluding the discount) is refundable. However, the payment gateway fee / bank charges, processing fee for mobile payment gateways as well as Cash on Delivery fee are non-refundable. Akorshoniyo Discount e Bus er ticket "Shohoz Korun!" Get attractive discounts every time you purchase Bus Tickets from Shohoz.com website, Android App and Hotline number (16374). Avail a discount of upto Taka 300 per ticket, everytime you purchase bus tickets through Shohoz Bus Android App, website, or hotline. Maximum of 4 seats can be bought per transaction/ order. When it’s about priority, you are the first! Come back to Shohoz.com to get guaranteed lowest price on our call centre, website and Andorid App for returning back to shohoz.com! Avail up to 300 Taka discount on bus tickets if you haven’t ordered for more than 3 months. This offer is valid for bus ticket orders from shohoz.com Android App, Website and Shohoz.com Call Centre (thorugh our Hotline Number 16374). Discounts are valid for valuable customers who haven’t purchased bus tickets from shohoz.com for the last 3 to 6 months. Discounts are subject to vary based on the seats / bus operators. This offer is not valid for Green Line Bus Tickets. This offer cannot be used to purchase bus tickets for travel during weekends, Eid travel, long weekends or government holidays. In case of trip cancellation by bus operators or due to strike (Hartal), full ticket price including Shohoz Fee of Taka 21 per seat (excluding the discount) is refundable. However, the payment gateway fee / bank charges, processing fee for mobile payment gateways as well as Cash on Delivery fee are non-refundable. To boost the internet usage among the citizens of Bangladesh and encourage them to make their lives easier and hassle-free while making their travel plans, Shohoz.com gaurantees an all-time low price on bus tickets. Users buying bus tickets from Shohoz.com website (www.shohoz.com), Call Centre (16374) and Shohoz Partners, can avail the lowest prices in bus tickets. This offer cannot be used to purchase bus tickets during Eid travel, weekends, long weekends or government holidays. This offer cannot be used to purchase tickets of Greenline Paribahan and Shyamoli Paribahan through Shohoz.com Call Centre. Get FREE Bus tickets while purchasing tickets from Shohoz.com website and Android App. After successful payment for the bus tickets purchased, eligible winners will be notified at the confirmation page. Winners of Free tickets will get cash back for ONE TICKET after completion of their journey. To be eligible for the cash back, winners need to post a status on Facebook with the caption "I have received a Free Bus Ticket from Shohoz.com!" (in public privacy) and also share the winning post shared from Shohoz.com Facebook page. Winners will receive a call from Shohoz.com Customer Care for verification purposes. To be eligible for the free ticket, users need to share 2 posts on their Facebook Profile. The posts should be made Public compulsorily, otherwise, cash back can not be processed. The offer is NOT APPLICABLE for purchasing tickets for Eid travel, Eid or long holidays. Cash back will be based on the discounted ticket price (if any) and not on the original ticket price. Winners are eligible to receive a cash back equivalent to the published ticket price of ONE TICKET. Shohoz Convenience Fee or any kind of processing Fee will not be included in the cash back amount. The offer is valid ONLY for orders whose payment has been made via bKash, Credit/ Debit Cards or Internet Banking. Tickets purchased through Cash-on-delivery are not eligible for the offer. It is to be noted, selection of eligible winners are solely decided by computer programs and algorithms randomly and involves no manual intervention. To be eligible for the offer, minimum two seats need to be purchased per ticket. A maximum of 5 lucky winners will be selected for the FREE ticket per day. Free Tickets are subject to availability of seats / bus operators. This offer is not valid for certain bus operators / trips. By Participating in this offer, eligible winners authorizes Shohoz.com to use thier photograph and name on Shohoz.com's Facebook page to announce the results. Shohoz.com reserves the right to change the terms and conditions of the offer or stop the offer at any point of time. Such revisions and additions shall come to effect from the date of publishing such update, change or modification on the site. Since it is a promotional offer, decision of Shohoz.com is FINAL. Any question against given decision is not acceptable. Buy at least 3 bus tickets of Nabil Paribahan and get cash back of 1 ticket. To avail the offer, customers need to use the Coupon Code "NABFREE" before selecting payment method. The offer is available from Shohoz.com website, Shohoz.com Android App and Shohoz.com hotline (16374). This offer is valid only for Nabil Paribahan bus tickets. This offer is valid for journey dates till 9th June 2017. The cash back applicable under this offer, will be processed after the user has completed his / her journey. Users need to use the Coupon Code "NABFREE" before selecting the payment method. The Coupon Code is available in the "Offers" section of Website and Mobile App. To be eligible for the cash back offer, users need to purchase at least 3 seats per ticket. This offer cannot be clubbed with Shohoz.com's regular Website and App discounts. Tickets purchased through the offer are non cancellable. Users eligible for cash back will receive a cash back equivalent to the published ticket price of ONE TICKET. Shohoz Convenience Fee and Processing Fee will not be included in the cash back amount. In case, tickets are purchased via Cash on Delivery, cash back will be processed through bKash or bank transfer. The offer is subject to availability of seats from Nabil Paribahan. Avail 10% Cashback when you buy Bus Tickets from Shohoz.com and pay through your Brac Bank Credit Card. This offer is valid only for Brac Bank credit card holders buying bus tickets from Shohoz.com. This offer is valid till 7 July 2017. The offer can be availed from Shohoz.com website (www.shohoz.com) and Shohoz.com Android App "Shohoz - Buy Bus Tickets". The cashback, applicable under this offer, will be credited to customer's card account within next 4 working day subject to the transaction being posted to the card account. Tickets purchased for Eid travel using this offer cannot be cancelled or re-scheduled. The offer is subject to availability of Seats / Buses. Maximum cashback amount will be BDT. 500.00 (Taka Five Hundred only) per day per card. Shohoz.com reserves the right to change the terms and conditions of the offer or stop the offer at any point of time. Such revisions and additions shall come to effect from the date of publishing such update, change or modification on the website and android app. In case of trip cancellation by bus operators or due to strike (Hartal), full ticket price including Shohoz Convenience Fee per seat is refundable. However, the payment gateway fee / bank charges, processing fee for mobile payment gateways are non-refundable. BRAC Bank reserves the right to disqualify a customer from this cashback campaign at any time at its sole discretion and without notice. Purchase transactions made by primary card holders as well as transactions made by supplementary card holders are entitled for this campaign. The standard Credit Card Terms and Conditions apply. If a card holder closes and/or cancels all his BRAC Bank Credit Card account(s) before the cashback is credited, the card holder loses his/her entitlement for the cashback, and is not entitled to any payment or compensation. Cashback will not be paid to the card holder's current and/or savings account with the Bank. Tickets booked for your journey between 05 Sep 16 and 17 Sep 16 are classified as Eid Tickets. SMS tickets are not acceptable for Eid Tickets. Please carry a printed ticket while travelling. Buy bus tickets from Shohoz.com Android App & get discount upto Tk. 300 on your first order. Get discount upto Tk. 150 second order ownards. To buy your tickets for Eid travel with ease and convenience, you are advised to download the Shohoz - Buy Bus Tickets Android App from Google Playstore. During Eid travel, bus operators reserve the right to CANCEL / DELAY trips or change BUSES / SEATS due to unavoidable reasons, which is beyond Shohoz.com's control. Please Note: In case of trip cancellations during Eid, passengers are requested to claim the refund for their tickets from respective bus operators / counters. © 2015 - 2018 Shohoz. All Rights Reserved. Shohoz.com, owned and operated by Shohoj Limited, is a premium online travel service provider which aims to make long distance travel in Bangladesh easy and convenient. Driven by the passion to serve you better, Shohoz.com went on to pioneer the online travel industry by offering bus tickets and launch tickets. In entertainment sector, movie tickets, event tickets as well as cricket match tickets are also available on Shohoz.com. Our team of energetic and young professionals with deep expertise in eCommerce and travel domains, leave no stone unturned to provide you the best of services at minimal costs through our user friendly website, Android App, Partner network all over Bangladesh and a multi-lingual call center. A trusted service backed by customer service excellence and innovation in operations, Shohoz.com provides information about pricing, availability, timings, and booking facility for bus tickets, launch tickets, movie tickets, event tickets and cricket tickets. If you do not have access to internet, you can call 16374 and get your bookings done. You can pay for the tickets via credit / debit cards, mobile payment gateways like bKash or cash. We offer Cash on Delivery (CoD), where you pay for your tickets in cash once your receive them at your doorstep.